Secret Symbol is a vibrant new slot release and the latest installment from slot game experts Real Time Gaming. The setting is a colorful jungle full of life and symbols designed to keep fans entertained for hours. The ancient and lost culture of the Aztecs is beautifully restored with impressive smooth graphics and symbols synonymous with that era. Below we run through the key ones and how you can uncover the secrets of this exciting game. The game has a 25-payline, five-reel layout which is available across all platforms covering mobile, instant play and download. Free spins are eligible and all symbols pay left to right except scatter symbols which pay any. 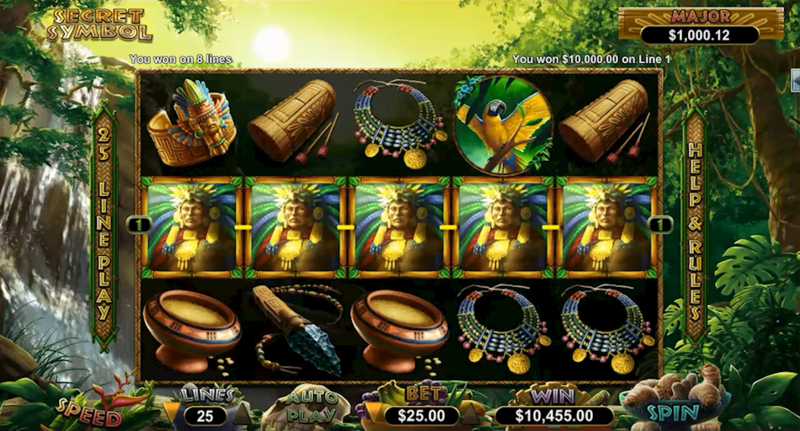 Prizes are earned by matching symbols across the reels, the amounts available in this game can be very high, which will suit many players, some as much as 50,000 times the bet per line. There are also some very special symbols that give additional prizes. The Aztec Chief is the wild substitute and this can take the place of any other prize winning icon in order to complete winning combinations. The pyramid is the scatter symbol and can trigger a bonus round in which players can win 10 free games. The Secret Symbol feature is a wonderful part of this game, and is represented by the appearance of the Aztec Chief. When he is seen on reels 2 or 4 he will cover the entire reel before pays are awarded. The Multiplier ranges from x2 to x20 and is applied to all wins in this game, the feature can also be retriggered. All things considered this is a great addition to the ever expanding library of Real Time Gaming slot games. With great payouts and bonus features it’s bound to be a hit with seasoned slot players along with providing great value for those who look for pristine gameplay, graphics and themes.